Which are the world's 20 most successful cities? Forces of globalization, urbanization and technological advancement are transforming the definition of a ‘successful’ city and reshaping the global urban hierarchy in the process. Success can no longer be measured simply by considering a city’s size and historical attributes. Today it is more likely to revolve around innovation, ‘liveability’ and the ability to transform and adapt to constantly changing socio-economic forces. 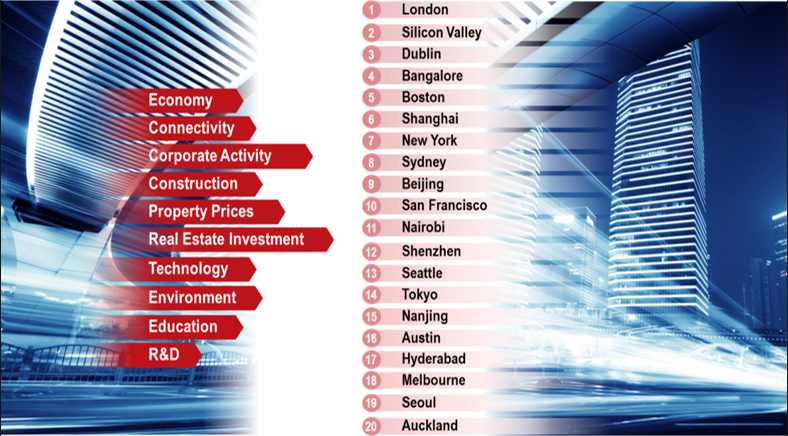 The JLL City Momentum Index (CMI) tracks the rate of change in urban economies and commercial real estate markets to identify cities with the most dynamic economies. Covering 120 established and emerging cities around the world, the CMI measures short-term socio-economic and commercial real estate momentum along with related measures of ‘future-proofing’: whether a city has the educational, innovative and environmental resources to maintain long-term sustainable momentum. The Index assesses a city’s real estate market dynamics – its rates of construction and absorption, price movement, and the attractiveness of its built environment for cross-border capital sources and corporations. Many of the top 20 cities in the 2016 CMI – including London, San Francisco and Sydney – are home to vibrant mixed-used districts which create and amplify opportunities to conceive and commercialize new ideas. This reinforces the idea that city momentum involves much more than GDP growth. It also requires building an innovation-oriented economy through technology. It means creating cutting-edge new businesses. And it involves attracting talent and nurturing a diverse and inclusive workforce. There is growing recognition that real estate can have a key role in accelerating city momentum by providing the infrastructure and environment for creativity, productivity, innovation and entrepreneurship. As a result, the role of commercial real estate is changing from housing businesses to envisioning and developing built environments that attract companies and talented people. To build momentum – or even to maintain their current competitive position – cities need to commit to bold moves. Such activities will be required to meet the demands of growing urban populations, to respond to increasing strains on resources and to support the shift to new and different types of economic activity. As we track the world’s top 500 significant urban transformation projects, it is neither a surprise nor a coincidence that several of the most visionary and innovative programs are found in CMI Top 20 cities. As the traditional concept of a global city hierarchy continues to shift, a new model of city clusters is emerging. It supports the idea that successful, innovation-focused cities come in different shapes and sizes. Established World Cities – London, New York and Tokyo, for example – remain dominant commercially, but face new competition. They continue to gain momentum, often by executing bold urban projects. For example, new university campuses and research centres are being developed in London’s White City and on Manhattan’s Roosevelt Island, while Tokyo’s role hosting the 2020 Summer Olympics is providing a catalyst for urban renewal. They are being challenged by other established cities which are competing for global reach and influence. Sydney’s economic and real estate momentum continues to accelerate, thanks in part to the development of mixed-use projects like Barangaroo, a waterfront project that includes a dedicated financial district. In Seoul, the Songdo International Business District is providing a template for smart cities. Emerging World Cities are on a fast track to maturity that is often driven by innovation. Bangalore and Shenzhen, for example, are home to some of the world’s fastest-growing tech companies. Others are working to develop similar attributes: Nairobi, for example, is pushing to become Africa’s technology center with development projects like Konza Technology City, an innovation district that will include space for educational institutions and technology firms. New World Cities are re-defining what it means to be global, as a number of these smaller cities compete successfully against larger neighbours. Dublin registered the strongest real estate momentum in the CMI. Auckland has emerged as one of the world’s most sustainable and liveable cities. And Austin’s educational system and low business costs continue to drive its strong growth in the U.S. technology sector. Our goal in developing the City Momentum Index is to provide a mechanism which identifies signals of impending change and highlights the characteristics that empower cities to compete successfully in a new and constantly evolving economic landscape.